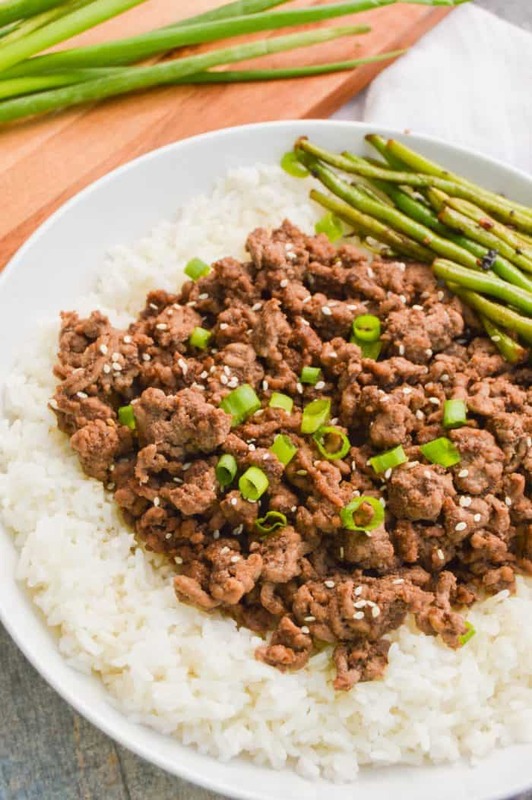 This Asian Ground Beef is so simple to make and full of flavor. 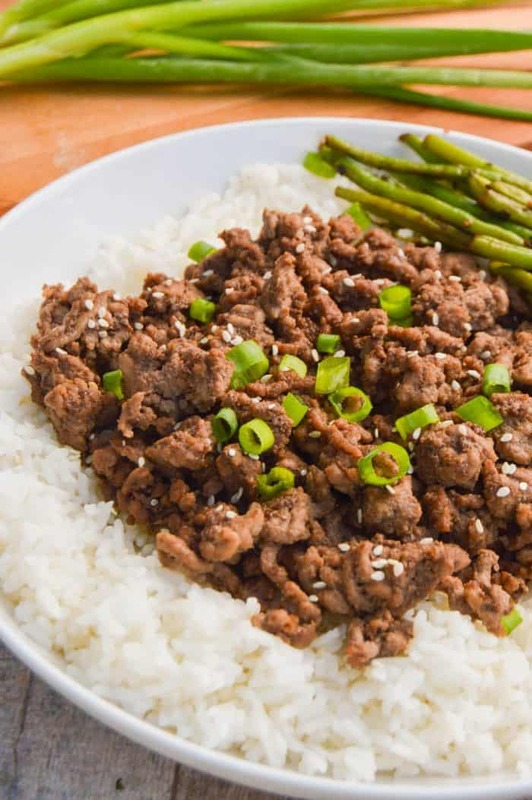 We served ours as a bowl over rice and topped with sesame seeds, green onions, and garlic skillet green beans. This recipe is so simple to make. I know I say this a lot and that is just because I only love to share easy recipes with you. Let me tell you though this one is so easy and don in less then 10 minutes. Yep 10 minutes and dinner is ready. Plus my kids LOVED it! Okay they didn’t eat the green beans but they loved the rest. 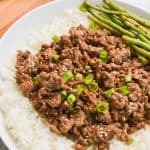 If you want more simple ground beef recipes then make sure to check them all out next. Cook and crumble ground beef in a large skillet. Once ground beef is cooked drain fat and return to stove top. Meanwhile in a mixing bowl whisk together soy sauce, vegetable oil, brown sugar, garlic powder, onion powder, ground ginger. Add this to cooked ground beef. Serve over rice with cooked green beans and green onions. 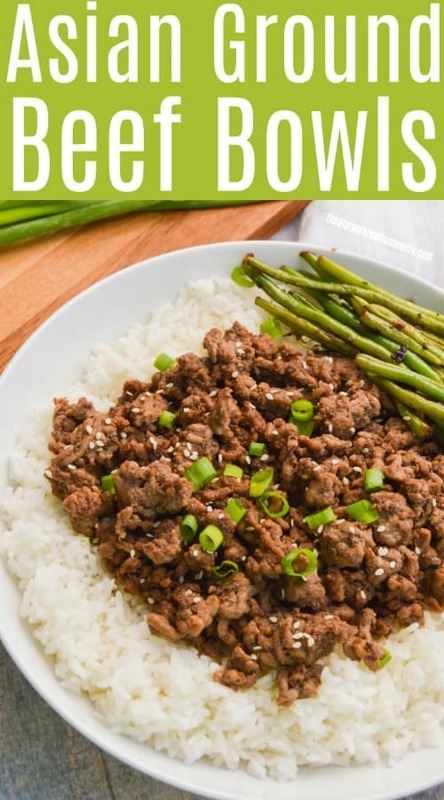 I served this ground beef over rice garnished with sesame seeds and green onions. To make the green beans follow my recipe for Skillet Green Beans and add in 1/4 teaspoon ginger to them. Slow Cooker Sweet and Sour Meatballs: This recipe is AMAZING! Really it’s a must try and one the we just love. Slow Cooker Asian Chicken Lettuce Wraps: This slow cooker recipe is one of my favorites. It’s so full of flavor and I love the crunch that the cashews give the recipe. Slow Cooker Orange Chicken: This recipe is so simple to make! Just for ingredients then served over rice. You maybe pretty shocked what I use to make it. Cook and crumble ground beef in a large skillet. Once ground beef is cooked drain fat and return to stove top. Meanwhile in a mixing bowl whisk together soy sauce, vegetable oil, brown sugar, garlic powder, onion powder, ground ginger. Add this to cooked ground beef. Serve over rice with cooked green beans, green onions, and sesame seeds.